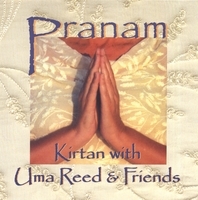 Prasad — New Kirtan CD from Uma & Friends! 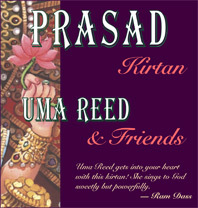 Prasad: grace; a gift from God; an offering made to the Divine, which is then distributed to devotees as a blessing. 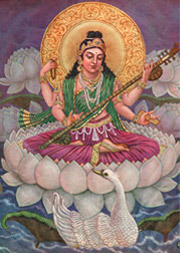 Our latest CD contains seven original kirtan songs, written by Uma Reed and Matt Packard. We strive to remain true to the time-honored tradition, spirit, and practice of kirtan, while offering the songs in our own style. On this album, we were blessed to include the exceptional musical talents of several friends including Jai Uttal, Geoffrey Gordon, and Ashana Sophia, as well as the engineering wizardry of award-winning producer/engineer Ben Leinbach. With this, our first CD, we invite you to join us as we pranam (bow) to the all-pervasive, loving Presence within. 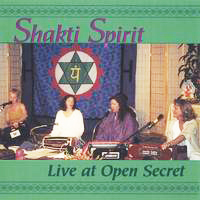 The songs on this album were recorded live during several kirtans with a small group of friends, raising voices and sharing hearts as we chanted the Divine Names together. Kirtan leaders Uma Reed, Diana Rogers, Sita Jamieson, and Carolyn Ross joined together for one magical evening. The decision to record the event was made at the last minute, with minimal equipment at hand – so the spirit of a "live" kirtan comes through. 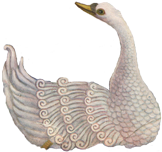 We invite you to raise your voice and sing along with us as we journey through the spiritual cosmos in praise of the Divine.